Bengaluru: Two days after the nationwide agitation, the bitter side of trade union protest reared its head in Bengaluru. 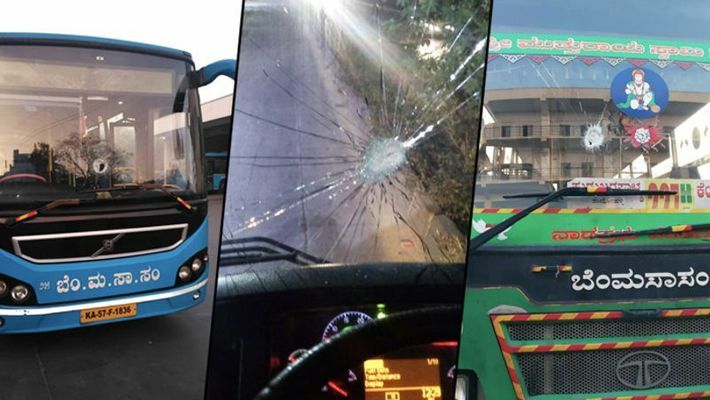 The Bengaluru Metropolitan Transport Corporation (BMTC) reported 79 incidents of vandalism on buses and cited a loss of 6.5 crore in two days due to cancellations and ceasing of operations. According to BMTC officials, vandals targeted public buses on Tuesday evening and pelted stones. The situation worsened on Wednesday. "The traffic and security wing of the BMTC is in touch with the police department. The FIR lodged in the cases booked will be taken seriously. The police will look into CCTV footage from wherever possible to identify and take vandals into custody," said an official. BMTC operated without any disruption on January 8 until the evening when vandals became active and the supply of buses in the city had to be reduced when the situation turned from bad to worse the next day. "On January 9, an order was issued to all the six zones to stop operations at 7:30am. Only a few buses operated with police protection. Out of 3,226 buses which usually operate every morning, only 428 were pressed into service. After reassessing the situation, at 3:30 pm, out of 6,037 buses only 1,855 buses started to leave from their respective depots. A loss of 6.5 crore overall was reported," said a senior official. The cost of damages to buses alone was reported to be Rs 8 lakh.